Academics from the University of Reading have been using the BTD-300 to investigate the early stages of thunderstorm electrification to help shed more light on how some convective clouds become strongly electrified. The electrified clouds generate an electric field near the ground of several thousand volts per metre even before the first lightning flash is produced. Data from the highly sensitive quasi-electrostatic antennas of the BTD-300 is used to detect the first signs of charge accumulating on raindrops and the presence of charged particles drifting in the wind. This data is then combined with profiles of the overhead cloud and precipitation measured by the observatory’s microwave radars, with additional fine detail of the atmosphere up to the cloud base provided by laser cloud base recorders. The BTD-300 will provide the range and bearing of all lightning activity up to 83 km (51 miles) from the site, which can be combined with radar and satellite images of the surrounding atmosphere and will deliver a complete assessment of developing thunderstorms. The extreme sensitivity of the BTD-300 allows the weak discharges within the cloud to be detected, before the first strikes to ground. The BTD-300 requires virtually no maintenance and can either interface directly to an integrated system or be operated using the supplied PC compatible display and logging software. The optional warning relay module allows the sensor to automatically sound alarms whenever a storm approaches. Biral is a founding member of The CTR Wilson Institute for Atmospheric Electricity and has been working with our academic partners to push forward the boundaries of thunderstorm science. Researchers at the institute have used the BTD-300 for detecting lightning and charged rainfall as part of a campaign to better understand how thunderstorms become highly electrified. 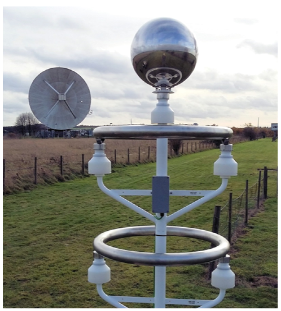 Image: Meteorological equipment specialists Biral have just installed a Biral BTD-300 thunderstorm detector alongside powerful cloud radars at the Science and Technology Facilities Council (STFC) at the Chilbolton Observatory near Andover.